You don't have to search for hours for beginning sound worksheets! As a special thank you, I have a gift for you! 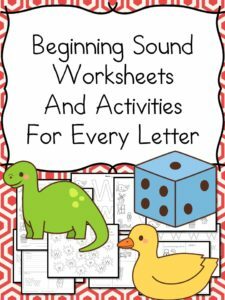 Grab over 500 beginning sound worksheets for just $6.98! For the price of two cups of coffee you could save yourself hours of time. Think of how amazing it will be to just download all these worksheets and not have to search any more! Get at least 16 activities for every letter! AND SAVE TIME.... Get our Beginning Sound Worksheet Bundle! Hurry....because soon this offer will be gone forever! Yes, it is only $6.98, but if you are not satisfied, we are not satisfied. No questions asked! No thanks...I want to pay full price later!